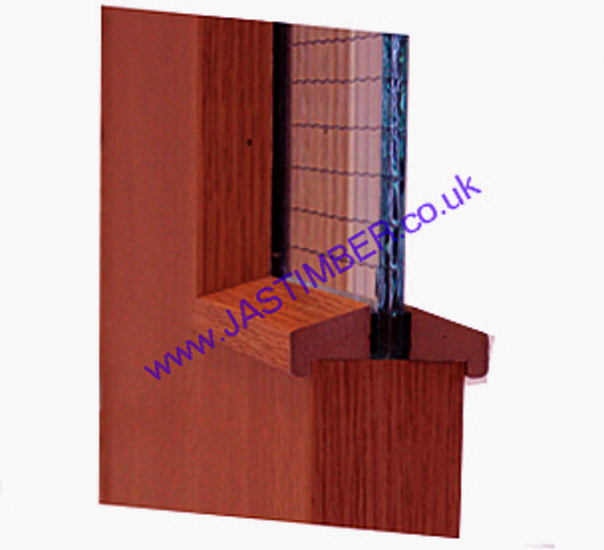 Sapele-MDF Hockey Mould Fire Bead is ideal to use as an internal firecheck door glazing bead. These foil printed-veneer fire-door beadings are manufactured using man made wood effect foil, pressed onto the MDF core. It provides a consistent colour match unlike natural veneer, or real timber bead. - 8 lengths in stock 01/04/2019 - Must be cut to 2 x 1.5 metre lengths for carriage, ( or lengths in the drop-down menu ). - Solid timber Dark Hardwood Fire Door Glazing Bead. - Solid timber White Oak Fire Door Glazing Bead. - Ash-foil wrapped MDF Fire Door Glazing Bead. - Beech-foil wrapped MDF Fire Door Glazing Bead. - Hardwood-foil wrapped MDF Fire Door Glazing Bead. - Maple-foil wrapped MDF Fire Door Glazing Bead. - Oak-foil wrapped MDF Fire Door Glazing Bead. - Walnut-foil wrapped MDF Fire Door Glazing Bead. - We cannot be held responsible for any variations in machined Sapele MDF sizes, pattern, grading, moisture content, treatment, certi­fica­tion, knots, colour or grain. - We cannot exchange any MDF Hockey Stick Bead once work has commenced. Orders of Sapele-MDF Hockey Stick Glass Beading, and Direct Deliveries are supplied as a Special Order. Sapele is a natural product - variations in knots, colour and grain should be expected - They are not defects. Timber Products should be treated and fixed in place as soon as possible to help minimise any movement/­twisting and surface checking/­splitting that occurs naturally with changes in moisture content. Sapele Foil-wrapped MDF Beads are not suitable for exterior use; External use is at your own risk. - We cannot be held responsible for any variations in Sapele-MDF FD30 Glass Bead sizes, pattern, construction, grading, moisture-content, treatment, certi­fica­tion, knots, colour or grain. We cannot exchange any Timber Product once work has commenced; Foil-Sapele Wrapped MDF Glazing Bead Orders at variance with our Stock-holding and All Direct Deliveries are supplied as a Special Order. Payment - We can take Debit Card, BACS, Cash, Cheque or Credit Card payment online for Sapele-Foil MDF FD30 Glass Bead. E. & O.E. see T&C - We do try to keep prices and specifi­cations of Sapele Glass Bead correct, but mistakes can be made! Please let us us know if you do spot any errors - thanks.